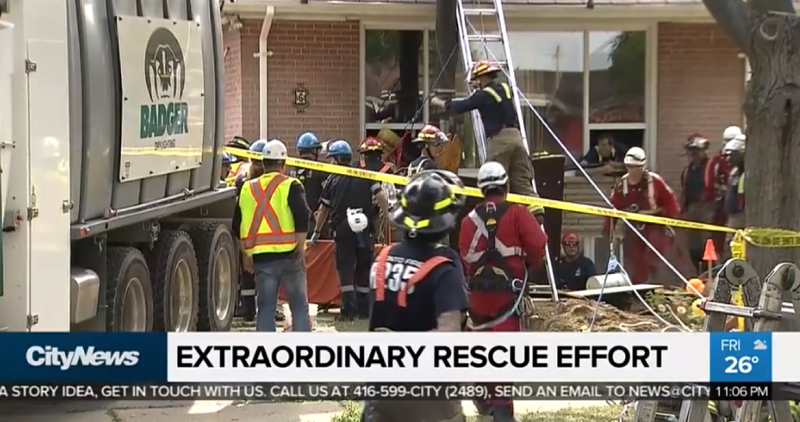 News: July 2018 – Badger Daylighting™ Emergency Rescue in Toronto, Ontario. It wasn’t typical call for Badger Daylighting™, but one we were grateful we could help with. On July 20, 2018 a man in Etobicoke became trapped when a trench he was working in collapsed. Emergency crews were called to the scene around 3:30pm to find the man buried up to his head. A neighbor had cleared away the dirt from around his face so he could breath, but rescue workers had to work quickly to remove the remaining debris without harming the trapped man. The Badger Hydrovac was close by and called to assist rescue workers in quickly and safely removing enough soil so the man could be pulled to safety. It was a tremendous effort from everyone involved and the man was admitted to the hospital in stable condition.